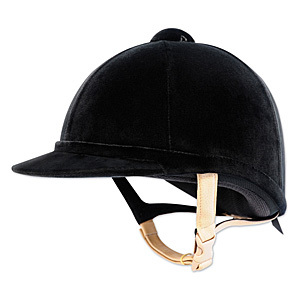 One of the most beautiful helmets available, the Charles Owen Hampton Helmet** is perfect for the show ring and hunt field. It’s covered in plush, luxurious Italian velvet and styled with a flattering low profile and gently rounded peak that shades the eyes and frames the face. The nylon reinforced tan leather harness is durable and soft. A luxurious gold satin lining and soft velour headband offer comfort against the skin. **ASTM F1163-04a/SEI Certified. This item is also available at our retail location in Mt Airy, MD. Our Retail location is just a short drive from Frederick, Damascus, Westminster, Baltimore, Gaithersburg, Rockville, Hagerstown or Columbia. We are located at the four corners of Frederick County, Montgomery County, Howard County and Carroll County, Maryland.